Plovdiv hopes for some cooler places for the summer, thanks to the efforts of the Sofia-based company ?Holis?, owned by Arch. Snezhana Veleva, and, of course, of the Municipality that is funding this project (although it might have been assigned to some local company?). To all the Plovdiv construction companies ? give it a thought! Obviously you do your job very slowly or very expensively, or both. So the only thing left for you is the water to enjoy it. Where exactly can you do that? 1. 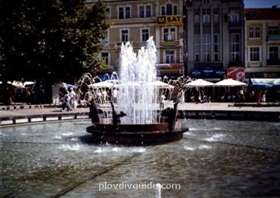 The fountain next to the former Balkan Cinema (at the Stefan Stambolov Sq.) is already working! A new multi-coloured mosaic floor was placed, as well as a new ?Siemens? pumping system, and new lights ? and the fountain is guarded by the SOT Security Company. 2. In the beginning of this week the construction of a new fountain on the Central Square will be starting ? right in front of the former Party House entrance, 15 x 15 m in size. This time the author of the project is the eminent Plovdiv architect Arch.Velichko Kourtev. Around that fountain there will be plenty of trees and also bunches, that will be donated by the same ?Holis? company. 3. The ?Belite Brezi? Park (meaning ?The Park of the White Birches?) is also under reconstruction ? the spot of the future fountain is bordered at the moment by the yellow police-band. It is expected to be finished by August 15th. That is the way Sofia-based companies are working ? fast, efficient and inexpensive. The cost is estimated to only 32,000 leva attributed by the Privatisation Fund, according to information given by the Regional Mayor Ms. Stefanka Lambreva. So, water will be flowing under the hills for The Day of Plovdiv ? September 6th, the Unification Day.